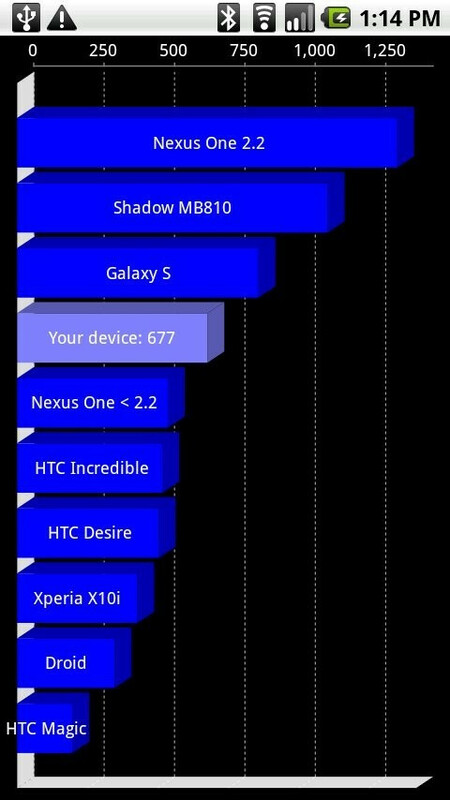 Benchmark test shows that the Motorola Shadow is faster than the Samsung Galaxy S? If anyone is interested in knowing how the Motorola Droid Shadow stacks up against the competition when it comes to sheer raw processing power, one will only need to check out the screen shot to quickly see where it ranks on a benchmark test. There was a Howard Forum member who attempted to benchmark his own Android handset via the Quadrant app which pops it up on a bar graph that's compared to a listing of other top bench-marked handsets out there. From what you can see, devices such as a pre-Android 2.2 Neuxs One, Samsung Galaxy S, and Sony Ericsson Xperia X10 are some of handset that are listed. Found just below an Android 2.2 Nexus One and ahead of the Samsung Galaxy S, the Motorola Shadow MB810 can be justified as one amazingly quick handset – but unfortunately this has yet to be officially confirmed. However, if Motorola's own Sanjay Jha's remarks about being "excited" for upcoming handsets is any indication, we can expect this handset to be up there in terms of raw power. how is it that a phone like the galaxy, which isnt even released yet tests that high? and what is this actually testing? most of them have the 1ghz processor and unless it has more than 512 mb of RAM, it is nearly the same as the Incredible. anyone have some clarification?